With milder weather, attractive promotions, and plenty of fun events, October can be a fine time to visit Disney World. Although weekends can still get pretty crowded at the parks, mid-week visitors typically enjoy many attractions with minimal wait times. And even the busier days tend to see smaller crowds than those in the summer high season. You can still benefit from Disney's FastPass+ system in October, so use it to cut down on longer wait times for popular attractions such as Big Thunder Mountain Railroad and Expedition Everest, which almost always have lines. Disney World treats most of October as value season, so look for special autumn promotions. Even if you already booked your trip, watch for discounts and deals before you travel. Visiting on a weekday also lets you save some cash as admission prices drop dramatically. Check ticket rates online and book ahead for the best prices. Some rides and attractions close for renovation and refurbishment in October. Be sure to check the schedule before you solidify your vacation plans to make sure everything on your must-do list will be open and operating during your planned dates. The Magic Kingdom closes at 7 p.m. on many nights in October for Mickey's Not-So-Scary Halloween Party, an event that requires a different ticket than your daily park pass. The later in the month you go to Disney World, the cooler the temperatures typically become, both in the daytime and at night. Despite an average mean of 75 degrees Fahrenheit, late October nighttime temperatures can drop into the low 60s and some days may hover in the low to mid 70s. The summer rainy season starts to wane in October, and the Orlando area averages 3.17 inches of rainfall during the month. Disney World typically sees about 13 rainy days during the month; however, most rain occurs during rather quick afternoon showers, so mornings and evenings both often bring sunshine even on the "rainy" days. The humidity eases a bit in October after the double or more average rainfall in the preceding summer months. But it's still a subtropical climate, with lush greenery. At the beginning of the month, you can enjoy about 12 hours of daylight, with the days getting shorter by about an hour by the end of the month. Even when the days feel cooler, you can still enjoy a trip to the water park or hang out by your resort pool. Disney pools are heated, so you can swim in comfort, even in October. However, it is smart to save wet rides like Splash Mountain or Kali River Rapids for the warmest part of the afternoon. Pack a light jacket or sweater and jeans or long pants for cooler Orlando nights. This also helps combat robust air conditioning in restaurants and retails shops. Shorts and t-shirts make comfortable attire for the park. Opt for sturdy walking shoes too. If you plan to enjoy water rides at Disney World, bring a backpack with a change of clothes to prevent a chill from walking around in wet swimsuits for the rest of the day. Disney World hosts several special events in October, including Mickey's Not-So-Scary Halloween Party, with ghoulish decor and haunting entertainment throughout the Magic Kingdom park. It's also the month to celebrate the best in food and beverages, with Epcot's International Food & Wine Festival, and the Swan and Dolphin Food & Wine Classic. 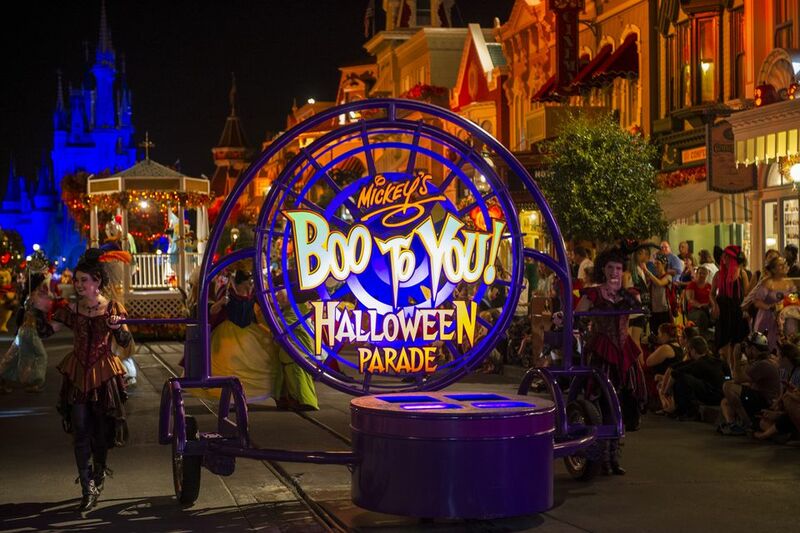 Mickey's Not-So-Scary Halloween Party: Come in costume, and enjoy trick or treating, parades, fireworks, costume parties, and not-so-scary shows at the Magic Kingdom. You must purchase a separate ticket for this event, which takes place on multiple nights throughout the month, culminating on Halloween. Walt Disney World Swan and Dolphin Food & Wine Classic: At the end of October, this two-day event on the causeway between the Swan and Dolphin hotels resembles Epcot's more well-known (and crowded) festival, with wines from around the world and samplings from the resort's top chefs. Lots of hour-long seminars give you the chance to brush up on your culinary skills. Epcot's International Food & Wine Festival: This months-long event is in full-swing during October. In the Global Marketplaces, you can sample the world's cuisines with gourmet small plates and exotic drinks. The Eat to the Beat concert series brings in top-name musical performers so you can dance off your indulgences. Cooking demonstrations, celebrity chef appearances, and food seminars round out the menu of food-centric events. It's smart to make Advanced Dining Reservations (ADRs) before your trip for most table-service restaurants. ADRs can be made within 180 days of your visit. There are lounges and quick-service restaurants available, but they don't take reservations and you run the risk of waiting a long time to get a meal. Restaurants closest to the resort fill quickly on Mickey's Not-So-Scary Halloween Party nights so make your dining plans accordingly and book ahead for dinner whenever you can. Crowds during Columbus Day weekend in early October rival those of the summer high-season and peak holiday times. Weekends during Epcot's International Food & Wine Festival get very busy as many local residents join the tourists for the festivities. Even without promotional rates, you can always save money by purchasing your Disney World tickets online rather than at the park's ticket windows. To learn more about the pros and cons of visiting Disney World during October, check out our guide on the best time to visit.